After a week’s holiday the blogging continues – as does my Italian Journey page. The guide book tells me that there are over a hundred churches in Venice – we are talking buildings, of course, for some of them are ‘redundant’ and some are now concert venues for the ‘Venice Experience’ of Vivaldi’s Four Seasons in period costume. Two church visits have set me thinking. 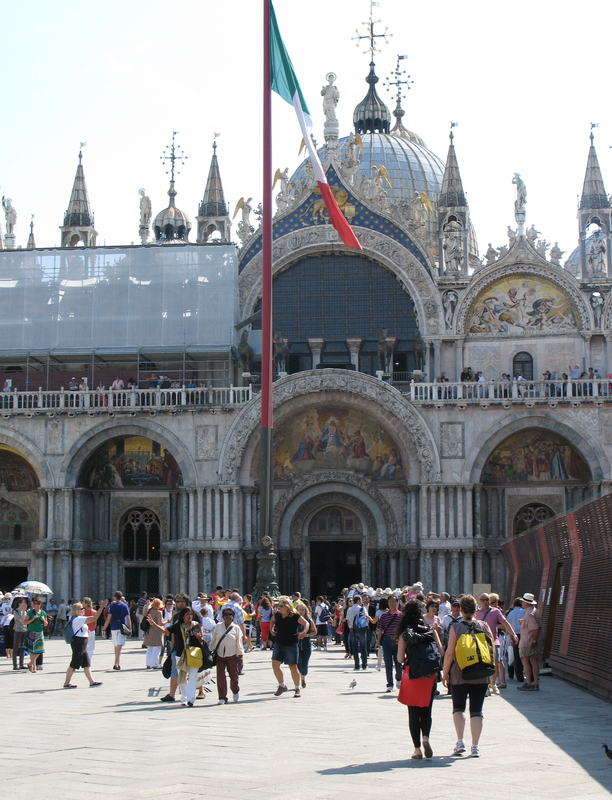 Yesterday was Pentecost Sunday and I walked to San Marco to worship at solemn (sung) mass in the basilica. I had visited last week as a tourist (in the rain) but now I wanted to return as a worshipper, albeit one who would have to participate in a language where I can manage (badly) a couple of dozen words and then dive for the phrase book. At first, the body language of the building was an ambivalent presence. I arrived early and had time to look around from my seat before the service began. I thought of the wealth of Venice as a trading city, of plunder from Byzantium and untold inequalities that enabled some to donate so much wealth for civic splendour and personal glory … and perhaps for the glory of God (very similar thoughts that come to me whenever I enter Westminster Abbey). The shape of the liturgy was familiar so I was able to follow the service of the word and then the familiar movements of the Eucharist. I had a fair idea what the readings were likely to be and so reflected on Acts 2 and John 20. The sung bits were in Latin so I knew them from concerts I have sung over the years and was able to join in – though not vocally – the choir was beautiful, singing renaissance settings from a gallery high up above the sanctuary (in one of the galleries for which Monteverdi wrote his Vespers of 1610). The archbishop was kindly and there was a confirmation of some young adults to boot. The sharing of the peace was warm and a goo d time was had by all. But what struck me were the mosaics – especially in the domes and the half dome of the apse above the high altar. From my place I could see throughout the service three images of Christ. First there was the crucifix above the screen between chancel and the nave – above and behind the presiding archbishop. Then there was the image of the ascended Christ above the congregation in the Ascension Dome over the crossing. 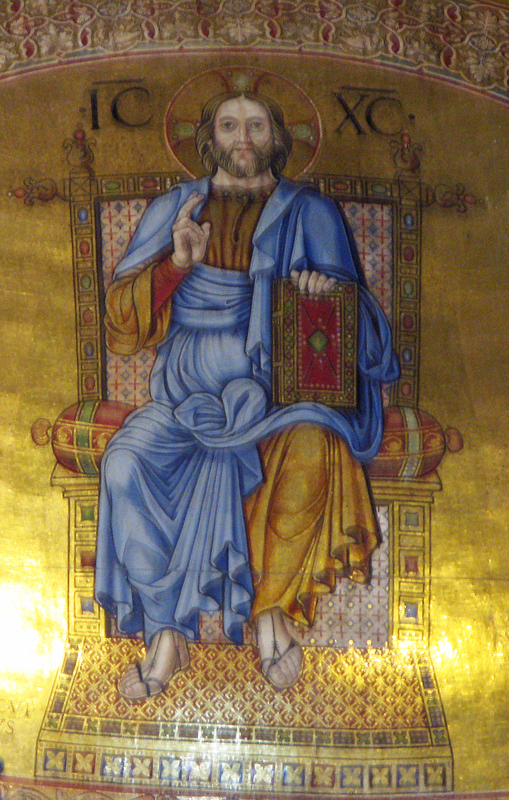 But most striking was the Christ Pantocrator – Christ, Ruler and Sustainer of all – which faces the congregation from the apse above the high altar. It was the continual presiding of the risen Christ – over the cross of crucifixion, over the reading and preaching of the word, over the praise, over the offering and breaking and sharing of bread – Christ over all, in all through all, for all. I didn’t understand many words – but I knew the gist of the service, and I know and am known by the one who holds all things in being and whose name is Love. What a contrast was the second church. This morning, I was on my way to the supermarket – a circuitous way as all journeys seem to be in Venice. On foot, over stepped bridges, down alleys and around corners. And with the canal equivalent of a back lane on my left, I noticed a small church on my right. Exploring inside revealed a building down at heel architecturally but vibrant with signs of current use and much popular devotion. A head just showed above an open copy of L’Oservatore Romano, the Vatican newspaper. On my tentative ‘Scusi’ a kindly face appeared above a Franciscan habit and he readily agreed that I could photograph a painting above the main altar that had attracted my attention. 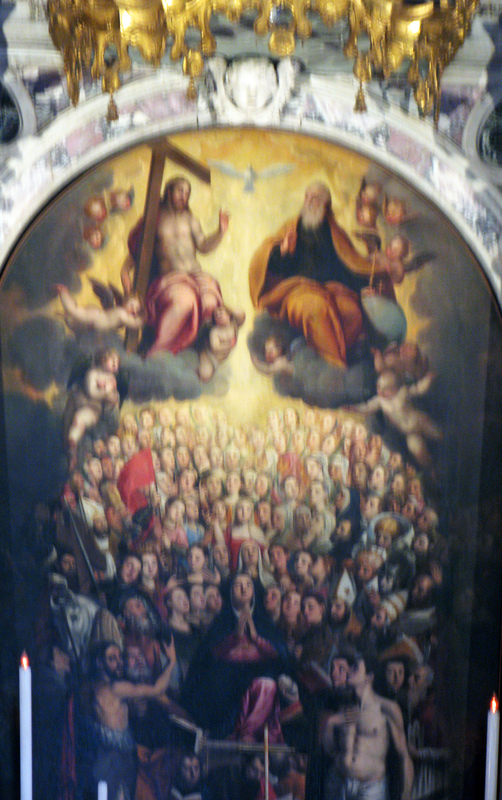 Originally a Carmelite convent church, it is now called Ognissanti – All Saints – and they are very much in evidence in the sixteenth century altar painting which portrays a crowd of saints adoring the Triune God. Perhaps not a great painting, and certainly a very dimly lit architectural setting, but the portrayal of the Trinity is theologically and spiritually powerful. Here is no suggestion of hierarchy, so common in much western art. Rather, here the Son, holding the cross as a sign of his incarnation and sacrificial death, is on an equal level with the Father and the Spirit hovers between them, the bond of love. Dingy and dark, surrounded by peeling walls – but the body language of this little church speaks of lived faith and faithful prayer and, at its heart, the love of the Triune God. So I took my photograph, then sat reflectively, then knelt prayerfully. Finally, with a ‘Grazie’ to the friar, I went to the supermarket. Thanks for the description of the visits. My only similar experience was attending mass at the cathedral. I think it was in Italian of which I probably only know 3 or 4 words. I would have been better with it in Latin. Welcome back. Missed you duirng your holiday! Thanks for all you are sharing along your journey – your insights, photos and artwork are really inspiring.